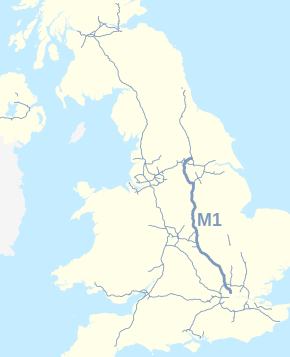 The M1 is a south-north motorway in England connecting London to Leeds, where it joins the A1(M) near Aberford. It was the first inter-urban motorway to be completed in the UK; the first road to be built to motorway standard in the country was the Preston By-pass, which later became part of the M6. 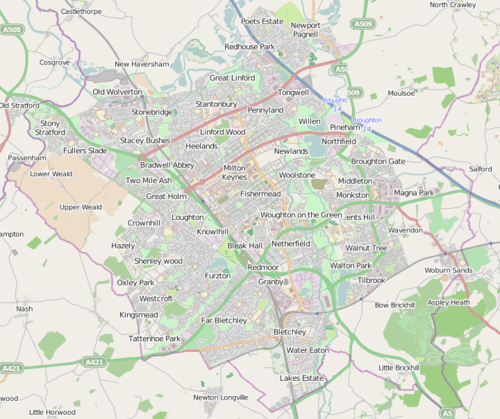 The first section of the motorway opened between Junction 5 (Watford) and Junction 18 (Crick/Rugby) on 2 November 1959 together with the motorway's two spurs, the M10 (from Junction 7 to south of St Albans originally connecting to the A1) and the M45 (from Junction 17 to the A45 and Coventry). Parts of the Hertfordshire section were built using steam rollers. The M1 was officially inaugurated from Slip End (close to Luton), this was celebrated by a large concrete slab on the bridge next to the village with inscription "London-Yorkshire Motorway – This slab was sealed by the Rt Hon Harold Watkinson M.P. – Minister of Transport – Inauguration Day – 24th March 1958". It was removed during widening works in 2007-08. In July 1972 the then UK Minister for Transport Industries, John Peyton announced that 86 miles (138 km) of UK motorway particularly prone to fog would benefit from lighting in a project which "should be" completed by 1973. Sections to be illuminated included the M1 between Junctions 3 and 14, and between Junctions 16 and 24. In August 2011, the Highways Agency announced that despite being converted to Smart Motorway status, the lights will be switched off on stretches of the motorway between Junctions 10 (Luton) and 15 (Northampton) without affecting road user safety. The motorway junctions and their approaches, and a section of the M1 on either side of Junction 11 (north Luton), would have lighting columns replaced and remain lit. All lighting columns from Junctions 10 to 14 have now been removed completely, apart from some slip roads. Junction 2 is about 2.5 miles (4 km) south of the original Junction 3. Southbound traffic originally left the motorway via a slip road which passed under the A41/A1 Mill Hill Bypass and looped round to join it at Fiveways Interchange. This slip road is still visible to southbound traffic approximately 650 yards (590 m) before Junction 2 and was maintained until the early 2000s though not accessible to traffic. The northbound slip road from the A1 is now partially used as the entrance way to a business park but no longer reaches the northbound carriageway as it is cut off by the motorway continuing south. Work to widen the 15-mile (24 km) section from Nottingham to Mansfield (J25-J28) to dual 4-lanes began in January 2008 and was completed in 2010 at a cost of £340 million. Average speed cameras, installed initially only for the period of construction, proved to be so effective that they were retained permanently. Following a public inquiry in March 2013 the Secretary of State for Transport announced on 18 July 2013 that work to update the Catthorpe Interchange between the M1 motorway, M6 motorway and A14 road close to Catthorpe would go ahead. Work on the £191 million 3 layer interchange started in January 2014 with an estimated completion date of 2016. The A5-M1 Link (Dunstable Northern Bypass) is to be a two-lane dual carriageway running east from the A5 north of Dunstable to join the M1 at a new Junction 11a south of Chalton. Here, it is intended to join with a proposed Luton Northern Bypass to form a northern bypass for the wider conurbation. The A5-M1 Link aims to alleviate traffic congestion in Houghton Regis and Dunstable, reduce journey times for long-distance traffic travelling through Dunstable and improve the regional economy. The Highways Agency is expected to detrunk the A5 through Dunstable when the A5-M1 Link opens to the public in early 2017. As part of the Dunstable Town Centre Masterplan, Central Bedfordshire Council is building the 2.9 km Woodside Link to connect the new junction 11a to the industrial areas of Dunstable and Houghton Regis. Most of the road will open to traffic in autumn 2016 with the remaining section connecting to junction 11a when it opens. There is a plan to introduce managed motorway technologies between Junctions 28 (Mansfield) A38 and 31 (Sheffield) A57 with work scheduled to take place between 2012 and 2015. Provisional plans exist for a managed motorway scheme including dynamic hard shoulder running on the M1 motorway between Junctions 32 and 35a serving South Yorkshire and in particular the urban areas of Sheffield and Leeds was confirmed in November 2010. 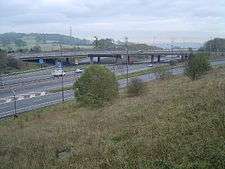 Provisional plans exist for a managed motorway scheme including dynamic hard shoulder running on the M1 motorway between Junctions 39 and 42 serving South Yorkshire and in particular the urban areas of Wakefield and Leeds was announced in November 2010 which includes a link to the M62 at Junction 42. There are plans to widen the M1 to dual 4-lane or dual 5-lane between Junctions 21 and 21a and construct a new link road between the M1 and the M69 including a new road bridge to take southbound M1 traffic over the motorway to connect to the M69. During this work the Leicester Forest East services would be closed. Consultation took place in 2007 and a completion date of 2014 is suggested. However the Highway Agency separately suggests that scheme development will "recommence" in 2014/15 with a provisional programmed start of works 2017/18. In 2002, a section of the M1 near Milton Keynes was cleared using mobile police roadblocks to allow for filming of the movie 28 Days Later. The M1 is the only UK motorway to use transition curves (spirals) to connect straights to curves (circles) as is usual with railways. This was found to be unnecessary and curves connect directly to straights (or curves of a different radius) on later motorways. ↑ "Driving directions to M1". Google. Retrieved 13 October 2013. 1 2 "Motorway archive". The Motorway Archive. Institute of Highways and Transportation. Retrieved 20 January 2008. 1 2 "Key facts about England's motorways and trunk roads". Highways Agency. Retrieved 20 January 2008. ↑ Bridle, Ron; Baldwin, Peter; Baldwin, Robert (2004). The motorway achievement volume 1. p. 57. ISBN 978-0-7277-3196-8. ↑ Chris Marshall. 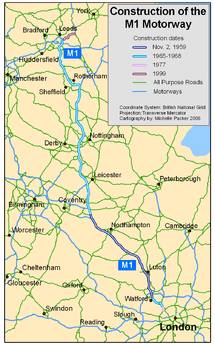 "Motorway Database – M1". CBRD. Retrieved 31 October 2009. ↑ "M1 - Highways Agency". Highways Agency. Retrieved 27 May 2014. In the early days of the M1 there was no speed limit, no central reservation, no crash barriers and no motorway lighting. ↑ "Tri-tandem roller 45655 of 1930". The Robey Trust. ↑ "The Slab". Retrieved 20 January 2008. ↑ "list of material held by Northamptonshire CC". Motorway archive. Retrieved 20 January 2008. 1 2 "News: Motorway lighting". Autocar. 137 nbr 3978: 19. 13 July 1972. ↑ "HA press release M1 J10-13 lighting". Nds.coi.gov.uk. Retrieved 31 December 2011. ↑ "Motorweek: More M1 barriers". Motor. nbr 3677: 40. 31 March 1973. ↑ "A1(M) Bramham to Wetherby - One Year After Study" (PDF). Highways Agency. p. 8. Retrieved 4 November 2015. ↑ "M1 Jct 6a to 10 Widening". Highways Agency. ↑ "9 Mar 2009 : Column 10W—continued". Hansard. ↑ "Protesters unfurl anti-M1 banners". BBC News. 30 October 2006. Retrieved 12 May 2010. ↑ "Campaigners outraged at escalating costs of road wideningCampaigners outraged at escalating costs of road widening". ↑ Jowit, Juliette (6 May 2007). "M1 widening to cost £21m per mile". The Observer. London. Retrieved 28 January 2008. ↑ "M1 widening J25-28: work to reduce congestion and improve safety starts in earnest". Highways Agency. Retrieved 20 January 2008. ↑ "£340m M1 contract to MVM consortium". ↑ "M1 works speed cameras will stay". BBC News. 3 January 2010. Temporary cameras installed for widening road works between Junctions 25 and 28 have proved so effective they will stay, it has been confirmed. ↑ "M1 Junctions 10-13 Improvements". Highways Agency. ↑ "M1 Jct 10 to 13 Improvements". Highways Agency. ↑ "A421 Bedford to M1 Junction 13". Highways Agency. ↑ "M1 Jct 19". Retrieved 28 February 2008. ↑ "Press release:Go ahead for two new road schemes in the Midlands". Department for Transport. 18 July 2013. Retrieved 13 October 2013. ↑ "Catthorpe: £191 million M1/M6/A14 junction improvement work to begin". 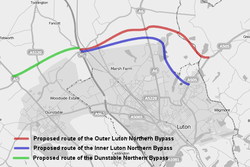 ↑ "A5-M1 Link (Dunstable Northern Bypass)". Retrieved 25 November 2014. ↑ "Dunstable Town Centre Masterplan". Retrieved 25 November 2014. ↑ "Woodside Link road". Retrieved 25 November 2014. ↑ "M1 J28-31 Managed Motorways". Highways Agency. 1 2 "Transport Secretary gives the go-ahead to 24 New Schemes and announces over £600M of further funding". Department for Transport. ↑ "M1/M69 Public Consultation Information – The new solution". Highways Agency. Retrieved 7 January 2010. ↑ "M1/M69 Public Consultation Information – what happens now". Highways Agency. Retrieved 7 January 2010. 1 2 "M1 Junctions 21 to 31 Improvements". Highways Agency. Retrieved 9 July 2012. ↑ "Bedfordshire Local Transport Plan 2006/07 – 2010/11 – Major projects". Bedfordshire County Council. Retrieved 17 August 2011. ↑ "All change at 10A?". BBC Local – Beds, Herts and Bucks. 9 September 2009. Retrieved 21 May 2011. ↑ "Death toll on British roads". Daily Mail. Thick fog was a factor in the deaths of nine people and injuries to 51 others in a massive 200-vehicle crash on the M1 north of Luton, Beds, in March 1972. ↑ "Blast demolishes landmark towers". BBC News. BBC News. 24 August 2008. Retrieved 24 August 2008. 1 2 "M1 is fully reopened after Mill Hill scrapyard fire". BBC News. BBC News. 26 April 2011. Retrieved 26 April 2011.